February is heart health month, and we’d like to take the opportunity to tell our patients a little bit about the surprising link between periodontal (gum) disease and heart health. Patients with gum disease are twice as likely to have heart disease, so visiting our team on a regular basis and staying on top of your oral hygiene routine may significantly decrease your risk for cardiovascular illnesses as well as oral health concerns. Keep reading to find out more. Gum disease is a chronic oral health condition that occurs when plaque and tartar build up at the gum line causing irritation, inflammation, and infection. This damages the soft tissue and supportive gum tissue. In the earliest stages, you may not notice any change at all to your oral health, but over time, gum disease destroys the tissues that connect teeth to the gum line, which can lead to tooth loss. How are Gum Disease & Heart Health Related? Research indicates that gum disease and heart disease are connected because bacteria is able to enter the bloodstream through the soft tissue sores caused by gum disease. Once the bacteria enter the blood stream, infection and inflammation occur. 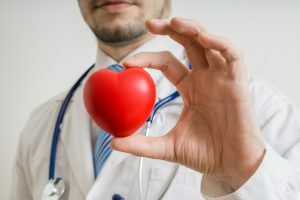 Oral bacteria have been discovered in the fatty deposits of people suffering from a variety of cardiovascular diseases, pointing to a solid connection between the two types of chronic illness. For patients who have heart disease and gum disease, both conditions will need to be treated in conjunction to ensure health improves. Communication is essential to ensure your doctors and dentists can provide adequate care to meet your needs. Make sure to talk to both your dentist and doctor and ask that they communicate as necessary to create a seamless healthcare plan. At the Washington, DC dentistry practice of Yelena Obholz, DDS, we partner with patients to prevent periodontal disease during every preventive dental appointment. We measure and chart the depths of the pockets between teeth and gums in order to discover periodontal diseases in their earliest stages and begin treatment right away. If you’re concerned you may be suffering from periodontal disease, please call the Aesthetic & Family Dentistry of Washington team right away. We’ll partner with you to create a plan to renew your oral health and keep your smile flawless.